Special Counsel Robert Mueller will reportedly subpoena Randy Credico - the man Roger Stone claimed was his backchannel to WikiLeaks, one day after Credico told MSNBC's Ari Melber that Mueller had previously requested a voluntary interview, which he declined on the advice of his attorney. "They didn’t call me in, they showed up and they asked me to come in and do an in-person voluntary interview," Credico said, adding "They asked me if I would like to do — we set up a conversation with somebody from the Mueller team and they asked my lawyer if I would like to sit down and do a voluntary interview." Melber then reported on Thursday that Mueller intends to subpoena Credico, according to "a direct source with knowledge of the special counsel's outreach," and that Mueller would issue the order in the next few days. Oddly, Mueller subpoenaed Roger Stone's driver, accountant and operative, John Kakanis in May. Also subpoeaned was Stone's social media expert Jason Sullivan to discuss WikiLeaks. Meanwhile the one man in Stone's orbit with a proven connection to WikiLeaks founder Julian Assange - Credico - never got the tap on the shoulder from the special counsel. Perhaps that's because he was "wearing a wire for Mueller," as Stone allegedly accused Credico of in an email? 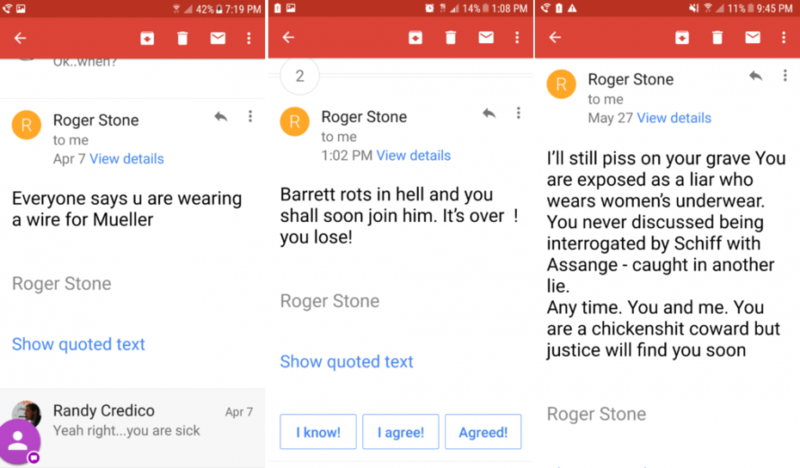 In the home stretch of the 2016 US election, Roger Stone bragged to the Northwest Broward Republican Committee on August 10, 2016 that he had "communicated with Julian Assange." When Stone said this, WikiLeaks had already released the Clinton and DNC emails - which revealed that the Democratic primary was rigged against Bernie Sanders, leading to the resignation of DNC chair Debbie Wasserman-Schultz within 48 hours. In November 2017 however, Stone backpedaled in a Facebook post, claiming that he didn't speak directly with Assange - and had instead asked then-WBIA Radio host Randy Credico - who interviewed Assange months earlier - to confirm the claim that WikiLeaks dumped the emails during the 2016 election specifically to hurt the Clintons. Assange made this abundantly clear in a June, 2016 interview with ITV, in which he said there were "more Clinton leaks to come," and that a vote for Clinton was a vote for "endless, stupid war." Credico has denied being a backchannel - telling progressive publication Artvoice in May "I was a confirming source, but I wasn't a backchannel. I wasn't coordinating with [Stone]." That said, the Wall Street Journal published details in May of an email exchange between Stone and Credico from September 2016, in which Credico said "I can't ask them for favors every other day." Later in May, Credico told MSNBC's Melber that Assange told him that he is willing to be interviewed by top ranking House Intelligence Committee Democrat Adam Schiff (CA) to prove there was no collusion in the 2016 US election. “He’s ready to show that there was no collusion ... he’s willing to sit with Schiff and be interviewed,” Credico said. And while Credico has tried to distance himself from WikiLeaks, Stone told Artvoice that "Credico insisted through the balance of August, and all of September, that Assange would publish what he had in October. He did." According to Stone, Credico knew. "I'm going to bury him"
In June, Credico told Manhattan weekly newspaper The Villager that he was "sick and tired of Roger Stone lying about him - and more recently, allegedly threatening him." “I’m going to bury him,” Credico told The Villager in a recent phone interview. Credico then told the publication that he had given all of his emails "back to when I was on AOL" to an unnamed "national, award-winning, well-respected magazine with a lot of influence" in order to prove his innocence. He then shared screenshots of what he says are "harassing: e-mails from Stone over a three-month period, but that he had lost "90 percent" of his text messages with the longtime Trump adviser. Stone's insults only get worse from there, alleges Credico - who told the Villager "He sends out e-mails early in the morning in an altered state." In other e-mails provided to The Villager, Stone blasts Credico as a “maggot” and “drunk cokehead” — and mockingly tells him to go snort more drugs. Credico has been open about his struggles with substance abuse. Stone says Credico forged the emails. “Sadly, Randy has, as he has with other media outlets, sent you cherry-picked e-mails which in many cases are severely edited,” Stone said in a text message. “Most are out of context or have been doctored. In fact, I have extensive evidence which I will turn over to authorities that demonstrates that he is the one who is threatening me while I have consistently urged him to simply tell the truth," Stone told The Villager in response. And now, Mueller is reportedly about to subpoena Credico - who, if he was indeed wearing a wire, will probably find the whole thing highly amusing.